Within the realm of wearables, the Kate Spade Metro Grand is the opposite to what you'd think when you think 'smartwatch'. It's small, it's shiny, there's no screen, and it says 'cheers!' on the watch face. Yet here it is, part of the Fossil Group's mammoth wearable tech line-up and the first piece of connected Kate Spade gear we've got our hands on for a test. 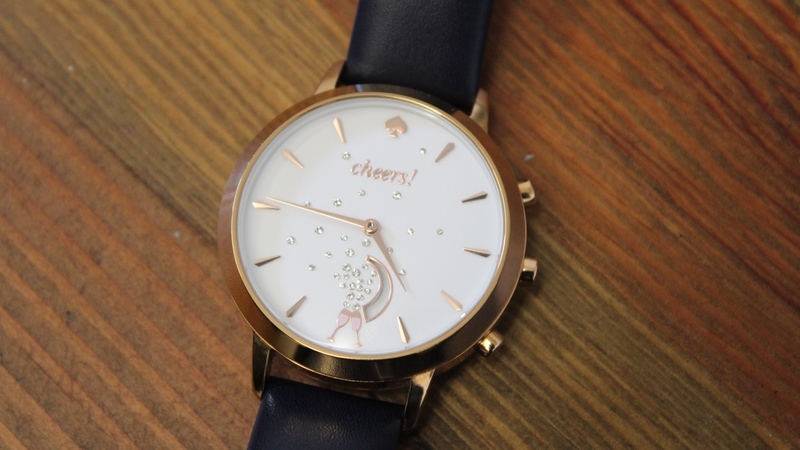 This is a hybrid smartwatch, aimed unabashedly at women, and all the better for it. It's also a work in progress that finds itself a few tweaks short of a blueprint for future hybrid connected designer watches. Still, Fossil is continuing to change our concept of a smartwatch, and the Metro Grand does a lot of things right. But is it worth your hard-earned cash? Let's find out. I've received a lot of compliments and near compliments in my time wearing the Metro Grand. These have ranged from "That's blingy" and "Ooh, is that the Kate Spade?" to "What's that? No way it has tech inside, what tech?" etc etc. With a gold finish, manic pixie pretty analogue watch face and preppy strap, the model I've been wearing looks far from a gadget. It feels polished, well made and expensive. It's comfortable too and light enough, though after a while I did feel like my arm was being weighed down a little. The one downside is its chunk, something Fossil Group is dealing with across its whole designer range for 2017. And yes, Kate Spade has already been showing off its wares at Baselworld, though these won't be arriving until autumn 2017. So yes, it sits up on the wrist and could stand to be half the width. In its defence, the shiny watch body doesn't suggest any tech is at fault for the size – it really does look it's designed that way. This will blend in with any outfit and, of course, function as a normal watch when you're not using the smart functions. This watch is available in various designs: rose gold casing with a thin, black watch face and black leather strap; gold casing with white watch face; gold casing with black watch face; silver model with a grey leather strap; and a gold casing with pale pink leather strap and white watch face. The diamanté champagne bubbles, 6 o'clock glasses and spade logo at 12 won't be for everyone, but are a nice dash of personality for those who are into that. Plus, the three buttons are really satisfying to press and the middle button has, you guessed it, a spade on. Speaking of the buttons, or 'pushers' in Fossil parlance, these can be customised for a number of actions including music control and remote smartphone camera (the bottom button), displaying step progress or another time zone. As with getting vibe alerts for messages etc from the connected smartphone, I found this to be hit and miss with some coming through and other times just… nothing. The Kate Spade can be set to change its hands to a particular contact to show who is calling, but we couldn't get this feature down either. You can also set the crescent moon cut-out on the watch face as a fill-in countdown to an upcoming event. It sounds simple but it's a good example of knowing its target audience. In use, the button presses worked nicely; a genuine time saver when you use it for play/pause for music and podcasts. And the app for iPhone and Android – simply called Connected – is beautifully designed and easy to handle even for beginners. There's an activity, sleep and goals dashboard, a section for notes to self, a 3.2.1 feature for the countdowns, 'Make the link' actions for the buttons and alarms in the main settings menu. Though as we say below, on Android we had a couple of Bluetooth issues, which we really wish would be ironed out. For fitness, the Metro Grand captures three things: steps, distance and estimated calories burned. It shows this in a lovely little graphic, showing footsteps completing a circle, with daily and weekly graphs and illustrations of how you're doing e.g. dots to show low, moderate and intense exercise. We wore the Kate Spade watch alongside a Fitbit Charge HR and found the hybrid to be significantly more stingy than the Fitbit (which is known for slightly overestimating steps, for instance). So for instance, where the Charge HR put us at 8,300 steps, the Metro Grand measured 6,600 steps over the same time period and worn on the same wrist. Likewise, it captured lower distance and calories burned estimates (say, 3.7km to Fitbit's 5.8km and 276 calories to Fitbit's 721). The difference, and our comparison with Google Fit and knowledge of the distances involved, lead us to believe the Fitbit is slightly over, Kate Spade slightly under. But we can say the Kate Spade is consistent over time – on sedentary days is showed us less than halfway to our goal, while on busy days it told us we'd smashed it. And hey, being slightly stingy will be better for those wanting to get active long term. When it comes to sleep tracking, there's less to report. It's comfortable enough to wear in bed, if not the lightest thing, and the app recorded our sleep and wake times as accurately as any wearable we've used – including those that use heart rate data for better accuracy. You're supplied with a graph of dots to indicate various stages of sleep and we can say these roughly corresponded, though, as always, we didn't get scientific in our tests of light and 'restful' sleep times and 'awake' times, as presented clearly and nicely in the app. For both activity and sleep you get a lowest, highest and average as well as a hint that, for instance, 'You slept 1h 13m/night less than last week' or 'last Wednesday: 6,904 steps'. The third tab of the app is for manually setting and keeping track of goals e.g. drinking water, exercising or any custom goal that has time and frequency metrics to update. As with any decent hybrid, the Metro Grand is powered by a coin cell battery which should last you a few months, if not the promised maximum of six. After two weeks of use, with Bluetooth on all day some of the time and just syncing every evening on other days, the battery percentage was still on over 75% according to the symbol in the Kate Spade Connected app. Another helpful extra: when the battery on your Kate Spade hybrid is low, both the hands on the watch will move to the 6 o' clock position and a warning will pop up on the app. When is a smartwatch not a smartwatch? When it looks like this. Kate Spade and Fossil are changing the game around what a connected accessory looks and feels like, and the Metro Grand is at the vanguard of changing what we expect from our wristwatches. Beautifully designed, this will made a good all day (and night) tracker, despite some niggles in use.